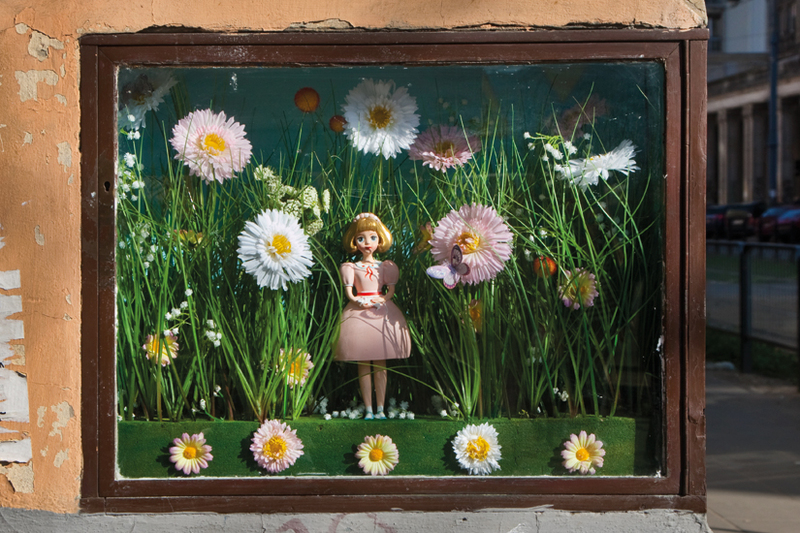 Artist Mirella von Chrupek tells the story behind her latest project: a tiny exhibition space found on a once gloomy corner off Plac Zbawiciela. What’s the idea behind your exhibition on Marszałkowska? The idea came to me when I was walking down the street one rainy Autumn day. It was a horrible day and I realized that it would soon be getting worse: rain, slush, snow, etc. I used to pass by this ‘display box’ on Marszałkowska 41. It once belonged to a cobbler who had his workshop in the yard and you’d see examples of his work in this ‘Gablotka’: that used to be quite a common thing for craftsmen to do. The shoemaker moved address and the box sat empty. Well to me it seemed like a good place for small exhibitions. I wanted to create a magical little world, something like a theater or an aquarium in which you could peer into and marvel at miniature worlds. Moreover, I wanted to create something that added a bit of color and cheer for people on their way home, and to demonstrate that something seemingly trivial could bring a smile to people’s faces. How would you describe the current exhibition? It was a really chilly evening and only four people turned up – I’m not surprised, given the choice I’d have stayed at home myself! Obviously deep down I felt a little bit sad about the attendance but at least I knew more people would see it on their way home from work. However, nothing prepared me for the reaction the next day. I was over the moon! So many people saw my Bulinka hidden in the grass – it was as if she embodied the spring everyone was waiting for. How would you describe your work to people who haven’t seen it? I’ve been collecting toys and dolls for quite some time now and photograph their ‘mini-worlds’. My intention is to create an illusion of parallel exsistences so that the viewer gets the impression these little objects lead their own life – only on a different scale. Recently I started designing toys and dolls myself. Designing them in 3D is something I would like to focus on right now, and my notebook is full of sketches of new creatures – I hope too soon give life to many new critters!